Remember the cardigan I talked about a few posts back? Well, it´s done and is currently drying after a wash. I will be making a post about it once it is dry and photographed. I bought some extra balls of yarn for that project so that I would be sure to have enough. Turns out I had plenty. When it was all done I had a little more than 3 balls left. I really didn´t mind, because this is one of the loveliest yarns I have ever knitted with, and I had decided whilst knitting on the cardigan that I would knit something for the baby if I had any left after finishing that project. My pattern of choice was a Wool diaper cover/soaker I have knitted once before. It´s a Norwegian pattern called Leine baby – bleiebukse. It´s knitted flat and then seamed together once it´s done. 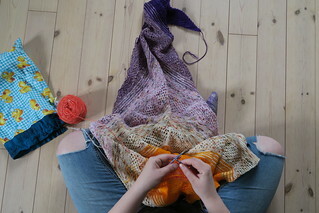 I think it´s knitting it flat that makes me feel like this is a fun knit. I used 3.5mm needles and knitted the ribbing 2 cm longer. The pattern doesn´t specify where to put in the holes for the i-cord, so I´m adding my notes for that part here. At least I´ll have good use of them! It´s not an exact number of stitches between each hole, but close enough for my taste. Note: knit the stitches in the established ribbing pattern. I´m generally not a fan of sewing my knitting, but I found a few videos from Purl Soho that showed me how to do the mattress stitch in both stockinette and garter stitch, and once I had a closer look at those, seaming was not a problem at all! Here are the links to seaming garter stitch and seaming stockinette stitch. Once the seaming is done, all you have to do is add a bit of ribbing for the legs and an I-cord. I knitted the ribbing two rounds longer than the pattern called for. And there you have it. A cute little baby diaper cover. It will be lanolized before it´s put to use of course. I still have two balls of yarn left. They will become a hat I think. But I´m also thinking about knitting a pair of nursing pads. They don´t need to be all white do they? There are quite a few of my friends that are expecting babies or have just had a baby, and as a knitter I think it is nice to make something for them. This project has been in the works since the end of April, and was actually a quick knit, but I got distracted along the way. I decided it was time to finish the project when the little one arrived last week. So this got all my attention all day yesterday, and it´s done and currently drying and waiting to be documented and wrapped. I used Drops Nepal from stash (I will weigh the blanket once it´s dry and add yardage to this post) and 5mm needles for this blanket. The pattern is “I ly” (roughly translated to “shelter”) from the book Nordic by Trine Frank Påskesen. She is a danish designer, but the book has recently been translated to Norwegian. There are a lot of lovely patterns in this book, and I will most likely be knitting a lot more from this book in the future. Including more blankets like this one, because it really is easy to memorize, and on big needles it works up so fast! (If you don´t get distracted…) This book was gifted to me, but it would be on my wish list if it hadn´t been. I got to be a part of the copyediting on this book, and I have never read knitting patterns as thoroughly in my life and it made me want to knit several patterns from the book because they seemed clear and also the designs are beautiful. Do you have a go to pattern or patterns for gift knits? I have this box that I don´t like to think too much about… It all started when I thought it was a good idea to cast on new sock projects when I was only half done with my current sock project… But have the big box of sock shame taught me anything? No. I still feel the urge to cast on new socks. Just the other day I decided that I should finish some of my sock wips. But now, when I´m close to finishing a pair of socks, I already feel the need to cast on a new pair… And if I keep knitting one sock and then casting on a new one without finishing the complete pair, this box will never be empty! I wouldn´t call it second sock syndrome, because I do want to knit the socks. It´s just that I want to knit all the socks at once! Anyone else have a box of never ending sock wips?